The most common answer I got to my questions at yesterday’s A14 consultation was ‘don’t know’, and really it came across largely as don’t care. Here’s an outline of the discussion I had. 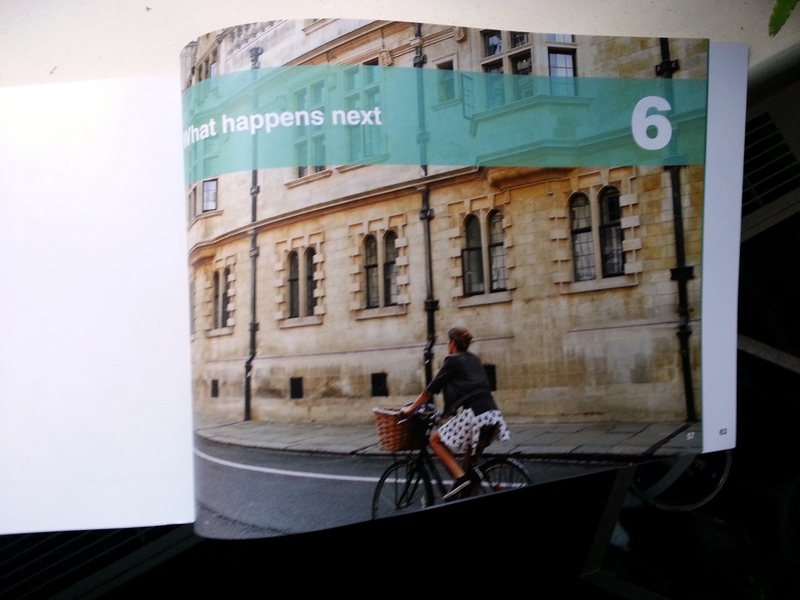 The A14 consultation brochure uses a picture of a bicycle and an old building as one of the chapter heads. This has nothing to do with the contents and is misleading greenwash. I asked what effect the new road would have on air quality in Cambridge city. The Highways Agency said they didn’t know. The said they will set up monitoring stations along the route and if necessary mitigation measures will be used. I asked what mitigation measures would be used if air quality was poor, I got no answer. I asked this three times and they mumbled and fumbled. Eventually one mumbled something about ‘reducing traffic’, which seems odd as their estimates show up to a 20% increase in traffic. They think that a reduction in stop-start driving and an increase in speed from 20mph to 70mph will reduce pollution. They had no information or modelling available to prove this. I find it astonishing that the detailed engineering has been done and yet the effects of pollution on 150,000 people in Cambridge and area has not been considered. This is despite an estimated 250 people per year (1 in 20) in Cambridgeshire dying early due to air pollution according to the government’s own estimates. This is despite the EU preparing to fine the UK government for failing to meet air quality targets. Just a few weeks ago pollution at Orchard Park School monitoring station (adjacent to the A14 in north Cambridge) reach 10 out of 10, or Very High. Air pollution is a serious and increasing issue in the region but the Highways Agency don’t seem to care. The Highways Agency claim they are working closely with Cambridge City Council. I asked where all this extra traffic would go when it reached Cambridge. The Highways Agency didn’t know. They said they had been working very closely with the City Council (and others) on this. Tim Ward, Executive Councillor for Planning and Climate Change, was surprised by this and hasn’t had any traffic data despite asking for years. Cllr Ward suggested that there could be 35% more traffic down Huntingdon Road (Cambridge). If true, this astonishing increase would likely bring that road to a halt at peak times. The City Council, to their credit, are setting aside £1.2 million to mitigate the congestion caused by the A14 works. However with changes to just one junction likely to cost £1m it’s open to question how much this can achieve. The Highways Agency were keen to say that they are ‘adding one more lane in each direction’. This isn’t accurate, they are adding an additional six lanes around Huntingdon. At some points they were claiming the work was to improve safety because of the poor junction designs of the existing roads, at other times it was about long distance travel. They did say that the road will have average speed cameras from end to end. They also said that the new road will be ‘busy’ in the Bar Hill section due to additional building, so it’s not even clear that congestion due to commuters will even be lower after widening. We could spend £1,500 million and end up with the same jams! At times they said there would not be a 20% increase in traffic and I had to point to their display information to correct them. 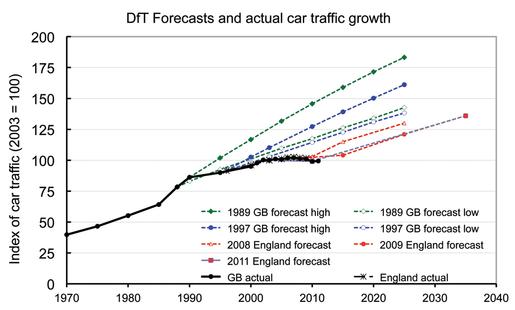 I pointed out that the DfT’s traffic forecasting had been incorrect for 20 years, they said the ‘models were better now’. The existing four-lane road from Fenstaton to Huntingdon will be bypassed by a six lane motorway and the existing road ‘de-trunked’ and passed to Cambridgeshire County Council to maintain. Although there will be some funds passed to the County in compensation, the County will bear the cost of this road. The County is currently almost broke and unable to maintain its roads and fund its schools yet its burden will be increased. The Highways Agency thought that the growth that the road would bring would offset the costs. It will also bring additional costs and I don’t believe they have any figures to prove their point. Cambridge City Council has not contributed to the cost of the A14 because it will not unlock development within the city. The Highways Agency said the City supported the project, I would say muted support at best. Prime Minister says ‘cycle proof’, Highways Agency says ‘Did he?’, Cambridge MP says ‘Groan’. 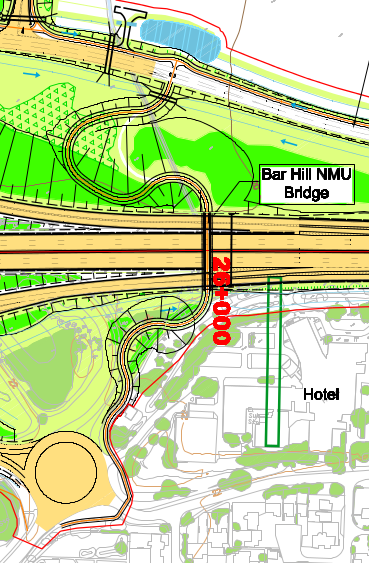 Proposed cycle crossing of A14 at Bar Hill. The Prime Minister said that all future trunk road schemes would be ‘cycle proofed’, though it was unclear what this meant in practice. So I asked what this would mean for this scheme. The Highways Agency’s first response was ‘Did he?’ Clearly the message isn’t getting through. The Agency’s approach to cycling can be seen in two parts of this scheme. Firstly the crossing of the A14 at Bar Hill. The snaking, sharply sloped path in the plan (right) is the cycle route. This route is far from the desire lines to Longstanton/Northstowe and to Cambridge. What would the Dutch do? Probably build an underpass. If you want to cycle from Bar Hill to Cambridge the proposed route is circuitous but it could be improved by an ≈0.5km section of cycle route connecting the south east edge of the Bar Hill perimeter road to the new local road that is roughly on the line of Oakington Road. Others have suggested this. The Highways Agency’s response was that they wouldn’t build it because they ‘couldn’t accommodate everyone’. So that’s the usual two fingers to cycling! The Highways Agency seemed unprepared or unwilling to answer my questions in any depth with any supporting information. Of course they won’t have to live with the consequences.